I had to take a little trip down to San Diego this afternoon. 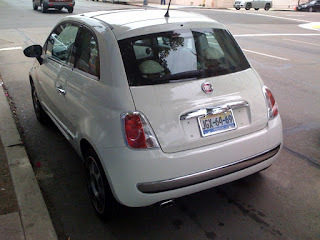 While stopped at a light, this diminutive car grabbed my attention. 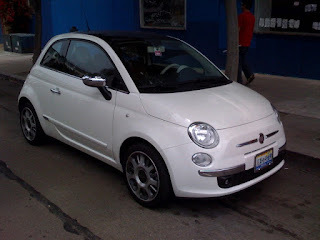 Why it's a Fiat 500. I'm familiar with the new generation 500. Launched in 2007, it's a modern take on the classic Fiat Cinquecento. Very much like what BMW did with the Mini brand back in the early 00s ("the zips"). Thanks to Fiat's recent takeover of Chrysler, these cool little cars should be available here late next year. Build your own 500 at Fiat's 500 microsite. Like the Mini, it's very customizable. So what's this one doing in the US? At first I assumed it was a manufacturer's media car. But look closely and you see a Mexican license plate. Yup, it's sold south of the border. One of the cool things about living here is seeing the odd Mexican-market cars from time to time. Small pickup trucks from Chevy and Ford (like the VW Rabbit pickup of the early 80s) and Renaults have been spotted over the past few months.